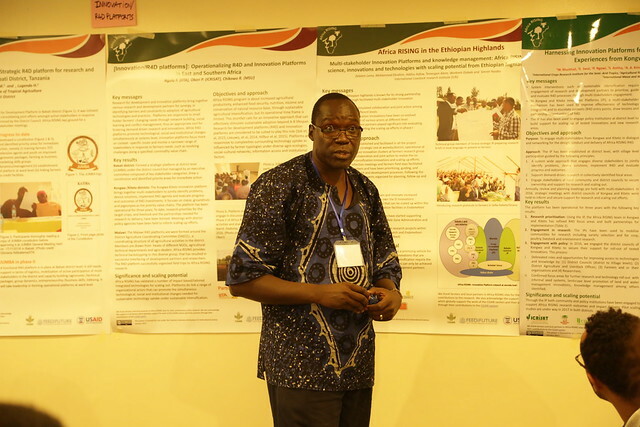 “Since system interventions require the engagement of various research and development partners, operating in the context of specific components within these systems, proper means for meaningful and effective interactions are needed to prioritize, guide, and evaluate the various research and development processes within Africa RISING….. The platforms will design, implement, evaluate project activities and disseminate and communicate research findings”. The recent Africa RISING program Science for Impact Workshop was a time to look at how these platforms were used in the first phase and how they should evolve in the second phase (2017-2021). The discussion was through a bus stop format where participants were divided up in to interest groups (Farmers, Extension Officer, Scientists, Government representatives, Private sector, NGOs – implementers), seeing the platforms from different perspectives. • To what extent to they really influence and shape research, or just facilitate research ‘rollout’. • Should they be sustained after the projects phase out? • Who will take ownership after the projects phase out? • Who will pay for them? • Shall we leave it so they evolve by themselves? There were so clear single answers to these questions. They need to be addressed on a case by case basis and used to inform the Africa RISING program second phase activities in this area. Lema, Z., Ebrahim, M., Asfaw, A., Alene, T., Dubale, W. and Yasabu, S. 2017. Multi-stakeholder Innovation Platforms and knowledge management: Africa RISING science, innovations and technologies with scaling potential from the Ethiopian Highlands. Poster prepared for the Africa RISING Science for Impact Workshop, Dar es Salaam, 17-19 January 2017. Nairobi, Kenya: ILRI. Munthali, W., Swai, E., Ngowi, P., Anitha, S., Kimaro, A.A., Rubanza, C., Jumbo, B., Makumbi, D. and Okori, P. 2017. Harnessing innovation platforms for sustainable intensification R4D experiences from Kongwa and Kiteto, Tanzania. Poster prepared for the Africa RISING Science for Impact Workshop, Dar es Salaam, 17-19 January 2017. Patancheru, India: ICRISAT. Ngulu, F., Okori, P. and Chikowo, R. 2017. Operationalizing R4D and innovation platforms in East and Southern Africa. Poster prepared for the Africa RISING Science for Impact Workshop, Dar es Salaam, 17-19 January 2017. Ibadan, Nigeria: IITA. Ngulu, F., Bekunda, M. and Lugendo, H. 2017. JUMBA—Strategic R4D platform for research and development in Babati District, Tanzania. Poster prepared for the Africa RISING Science for Impact Workshop, Dar es Salaam, 17-19 January 2017. Ibadan, Nigeria: IITA. Tags: AfricaRISING, innovation platforms, R4D, USAID. Bookmark the permalink.